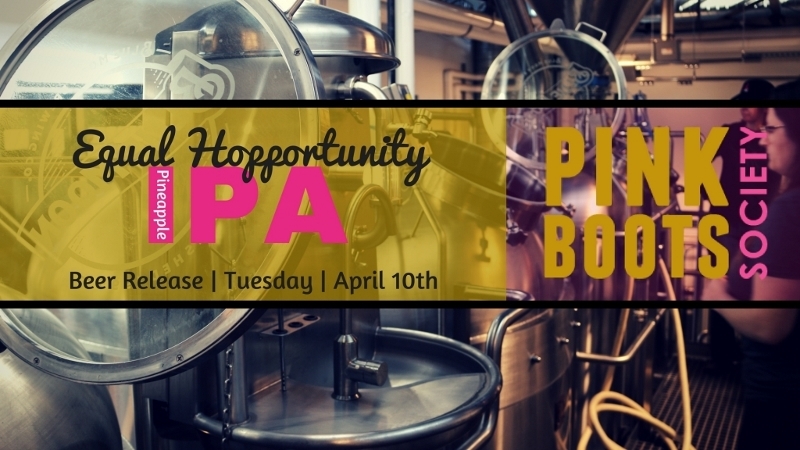 The Denver chapter of the Pink Boots Society, an international organization for women in the brewing industry, is releasing a special beer on Tuesday, April 10. Get a pint of Equal Hopportunity Pineapple IPA at a craft brewery near you and at a special release party at Blue Moon Brewery beginning at 6 PM. This special beer is a Fruited IPA made with 10-15% wheat, 5% Munich Root Shoot malting and 5% Great Western Slightly Lactic Malt. The hops are a custom blend by Pink Boots and include Palisade, Simcoe, Mosaic, Citra and Loral. The beer was brewed at Blue Moon Brewery in RiNo and kegs are available for FREE to local businesses on the condition that the beer’s profits be donated to the Pink Boots Society education and scholarship funds. There are still kegs available for any business wanting to participate. Participating breweries that will be serving the beer starting on April 10 include Dry Dock, Eddyline, Great Divide, Blue Moon, Woods Boss, De Steeg, Blind Faith, Launch Pad, High Alpine, Black Shirt, Coors Distributing Company, Brix Taphouse, I HOP IPA, Twenty Brew Taphouse and Colorado Plus Brew Pub.